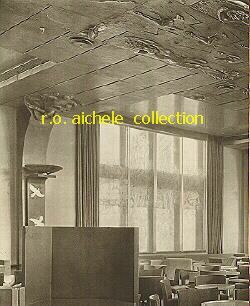 Copyright 2018 by Richard O. Aichele & Information Works Inc. 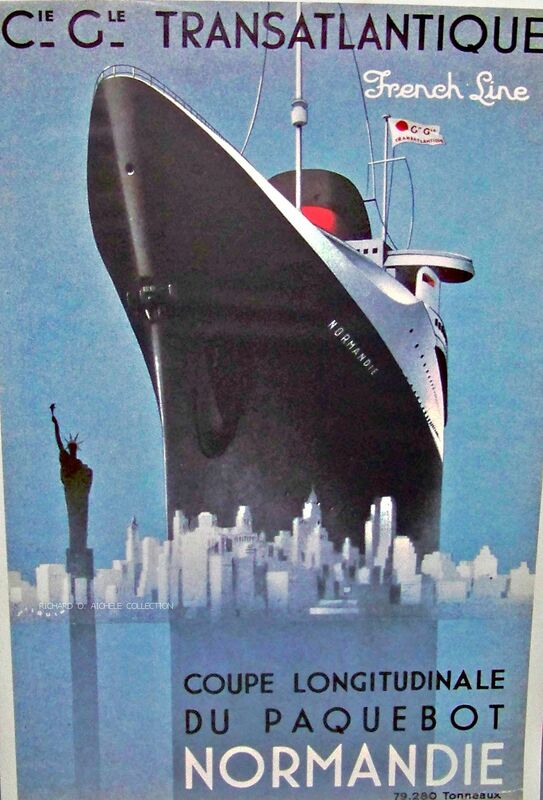 The ocean liners between 1900 and 1939 represented the finest examples of steadily advancing technologies, artistic styles' evolutions from Victorian to Art Deco, and the growth of internatioanl travel that brought people together worldwide. 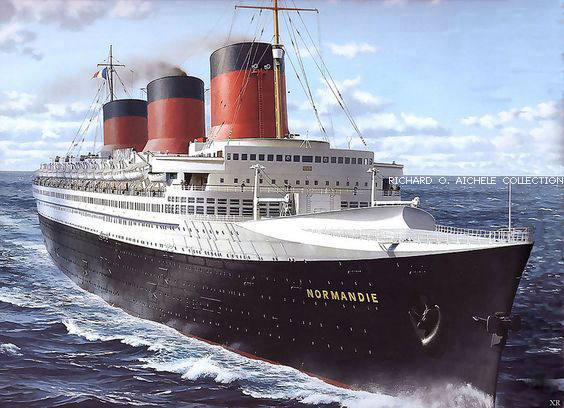 Incomparible is the descriptive word that has been applied to the S.S. Normandie trans-Atlantic passenger liner ever since her first trans-Atlantc voyage from Le Harve to New York City in 1935. 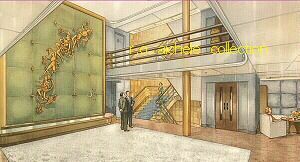 The ship's interior designs were a combination of Art Deco and Modererne that included sculptures, mirrors and wall murals. 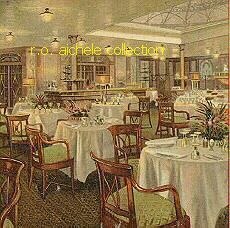 The magnificent Grand Salon First Class dining room shown below was 305 feet long. The ship's marine technologies advanced the 1930s shipbuilding state-of-the-art. The hydrodynamicaly designed hull with a clipper style raked bow combined with an underwater bulbous forefoot feature reduced water reistance while cruising. 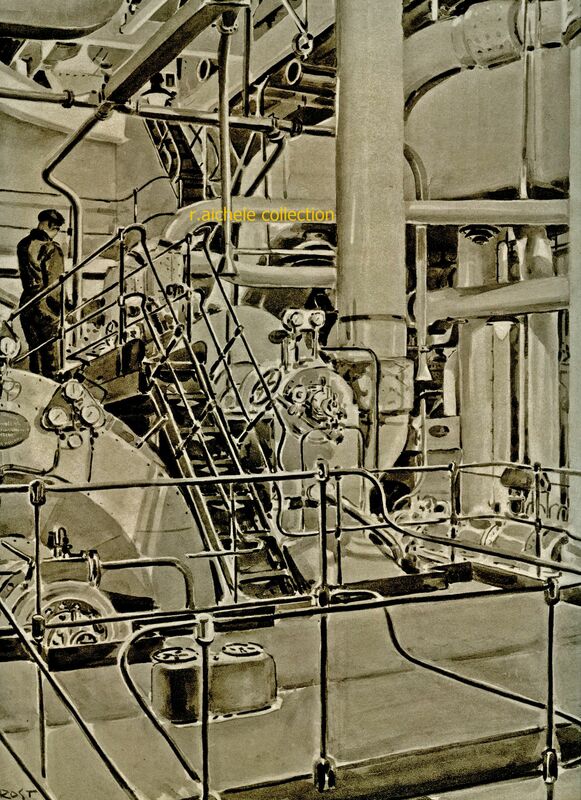 The ship's turbo-electric propulsion system consisted of four double expansion turbines. Each turbine was connected to an electric generator that powered an electric motor driving one of the four propellers. In later years, the original four three-bladed propellers were later replaced with four-bladed propellers to further reduce ship vibrations at cruising speeds. 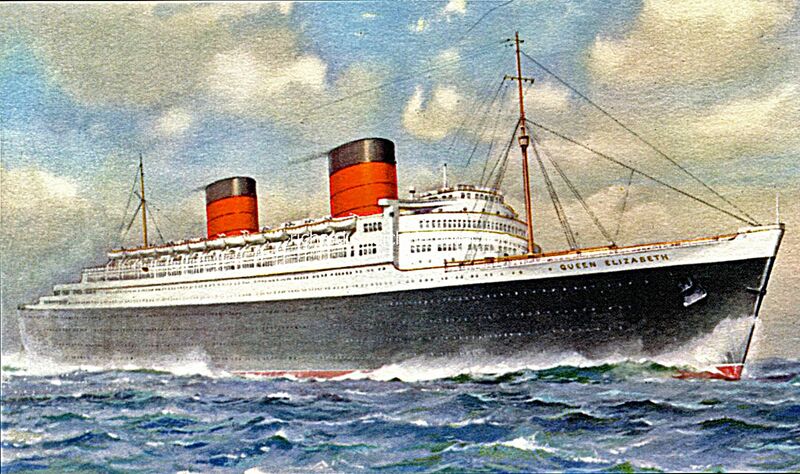 Making the maiden voyage across the Atlantic in four days, three hours at an average speed of 30 knots, the 79,280 GRT liner won the Blue Ribband speed record. 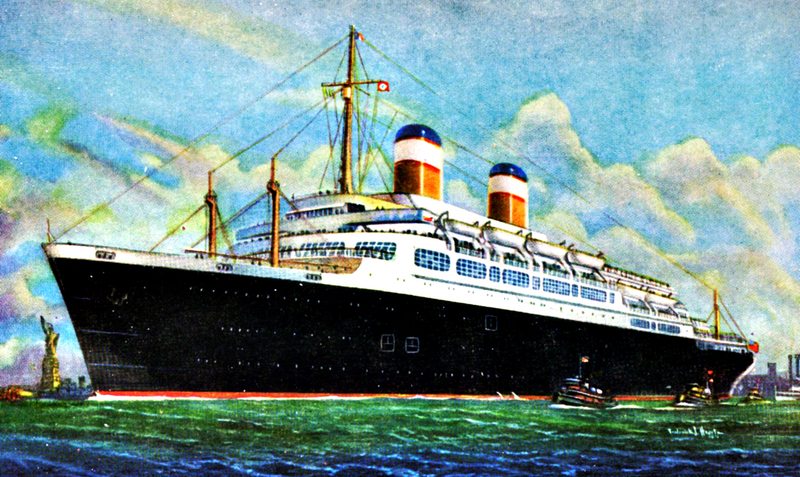 The 20th Century at sea was the era of expanding international travel, architectural style changes from Victorian to Art Deco, technology advances from coal furnaces to diesel engines and continual improvements for passenger comforts in all classes with attention to safety at sea after the lessons of the R.M.S. Titanic. 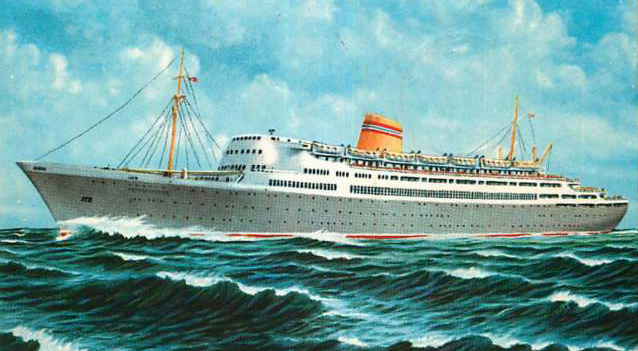 The S.S. France christened in 1960 offered "extraordinary opulence with classic touches" including murals painted by famous artists and the teak decks on the glass enclosed proenades. Later, as the S.S. Norway, the ship retained those classic features blending them with "modern architectural and decorative enhancements." 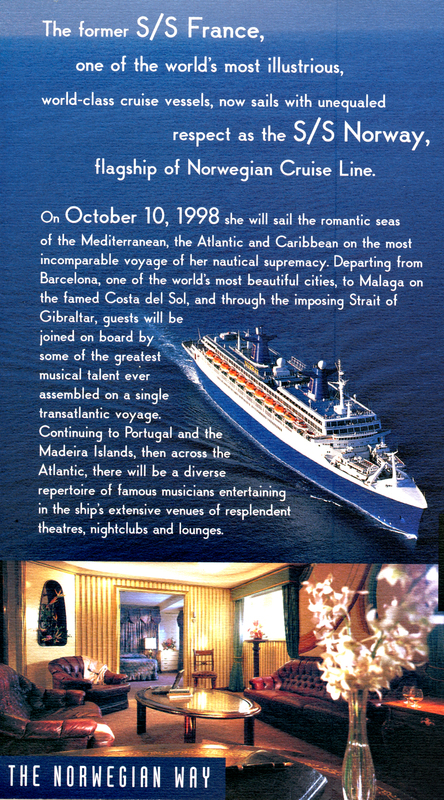 And still, in 1998, under the flag of the the Norwegian Cruise Line this ship offered "wonderous transatlantic sailing experiences." 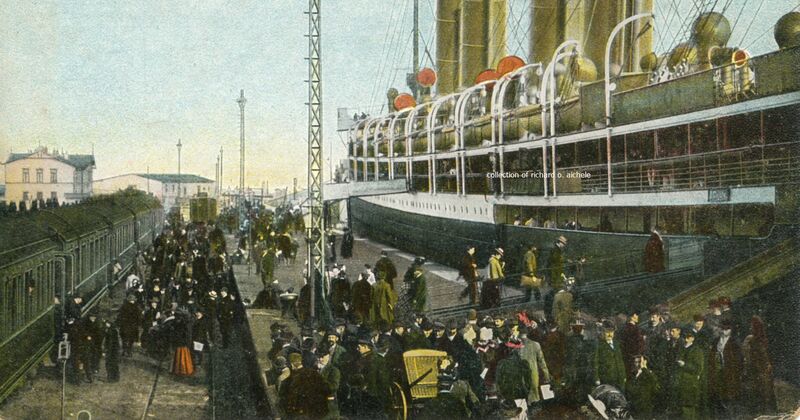 The ship set a new standard of excellence for ocean travel when it sailed from Hamburg, Germany on the maiden voyage to New York on Oct. 1, 1905. 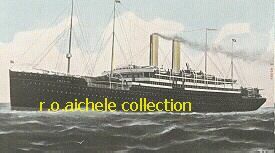 Owned by the Hamburg-Amerika Linie, the new ship was designed to attract passengers with unmatched luxury and superior service without attempting to make any speed records. The 668 foot long, 22,225 gross ton liner boasted many technological innovations including a Marconi Wireless system, an automatic fire extinguishing system and electrically controlled watertight doors that could be operated from the bridge. The ship could accommodate 420 first class, 254 second class, 223 third class and 1,765 steerage passengers. Passenger comforts were second to none and included the first passenger elevator aboard an ocean liner. The elevator was a great attraction and made 1,825 trips during the maiden voyage. This separate dining room seated 120 guests under a stained glass skylight and portholes were replaced with large square windows offering panoramic views. 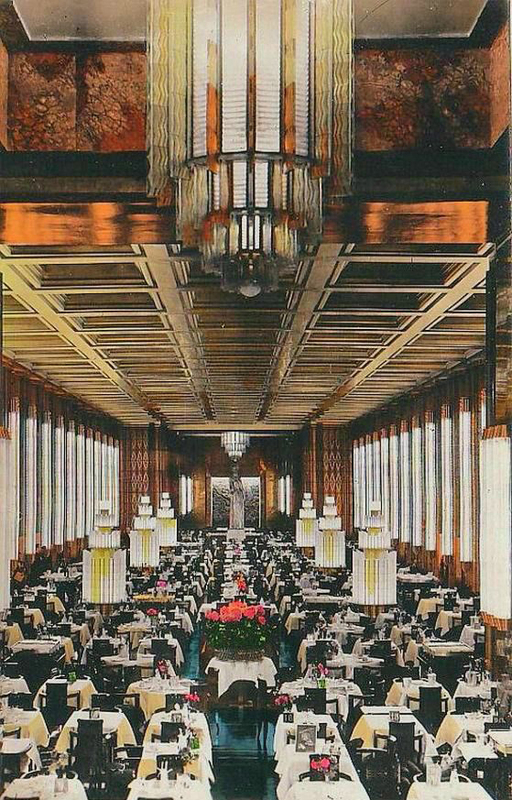 The concept proved so popular, the Ritz-Carlton restaurants were installed on other Hamburg-Amerika liners and later copied by other European steamship lines. 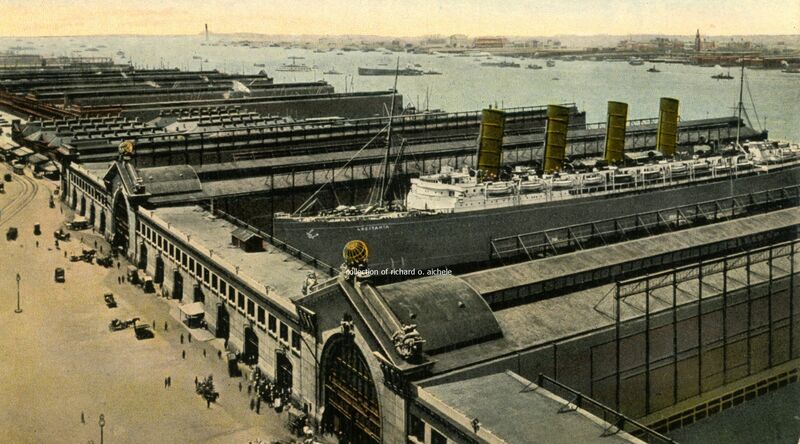 The S. S. Amerika sailing from the Hamburg-Amerika Linie's Hoboken, New Jersey piers in the Port of New York. The year was 1912 and the Amerika's Chief Steward, G. Scholz, making a morning inspection of one of the ship's food storerooms. The Chief Steward supervised all activities in the nine kitchens that provided food for the passengers' superb dining experiences. The kitchens included one exclusively for the Ritz-Carlton a la carte restaurant on board, two kitchens for steerage passengers and a kosher kitchen for orthodox Hebrew travellers. Afternoon tea served promptly at 4 was a tradition at sea aboard the trans-Atlantic liners. Here on the Amerika's Promenade Deck, attentive stewards served tea, cakes and small sandwiches to the passengers. The S.S. Amerika sent a wireless message on April 14, 1912 reporting the location of two large icebergs in the North Atlantic. Several hours later the Titanic struck an iceberg and sank in the same area. 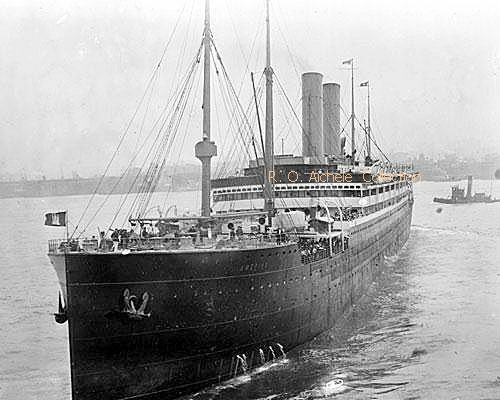 When World War I broke out, the ship was interned in the U.S. and later seized when the U.S. entered the war, renamed S.S. America and served as a American troop ship. Later, over the next forty years under the American flagged U.S. Lines and renamed S.S. George Washington the ship served again in service as a passenger liner, troop ship and spent several lengthy periods laid up in storage. She was scrapped in 1957 having sailed longer and further than many of the more famous liners built in the early 1900s. "Twenty or more years of service lie ahead of a new ship. It's construction, therefore, is a continuous confrontation of the present and the future. Every ship offers a temporary solution of this permanent problem. And although shipping is as international as the ocean by which it lives, every ship reflects national qualities in addition to a period in construction. 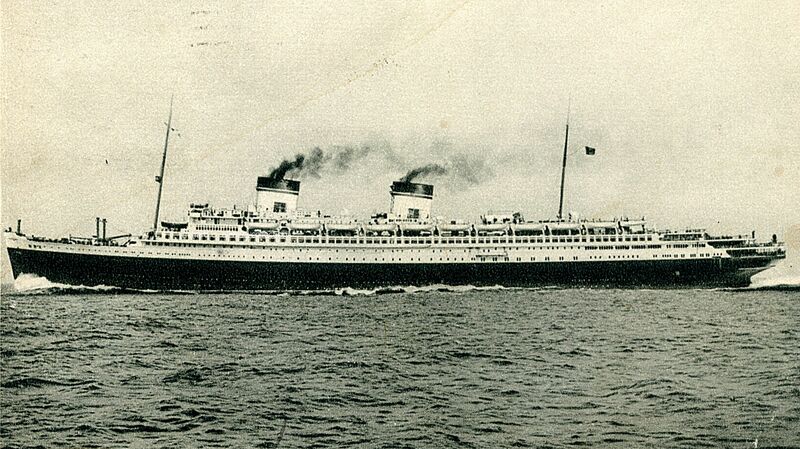 The Nieuw Amsterdam is such a solution of 1938 and bears the mark of the Netherlands." Completed by the Holland-America Line in May, 1938 for the North Atlantic trade, the S.S. Nieuw Amsterdam was one of the last vessels built with "old world" tastes in interior decor and comforts. 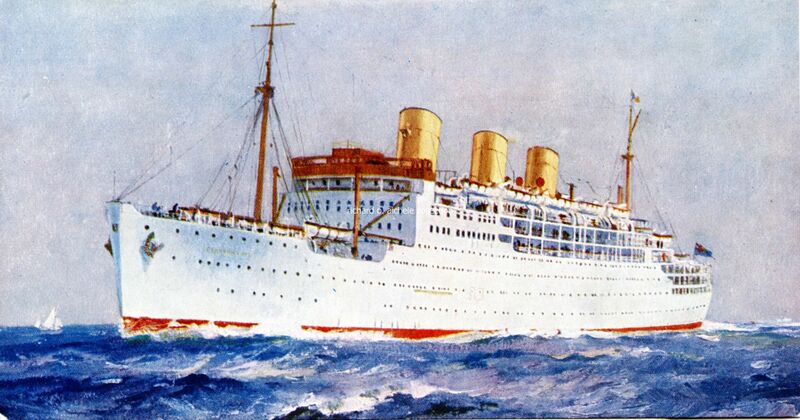 The ship's trans-Atlantic career was cut short by the outbreak of World War II during which she was converted to carry thousands of troops and operated by the British government as a troop transport. 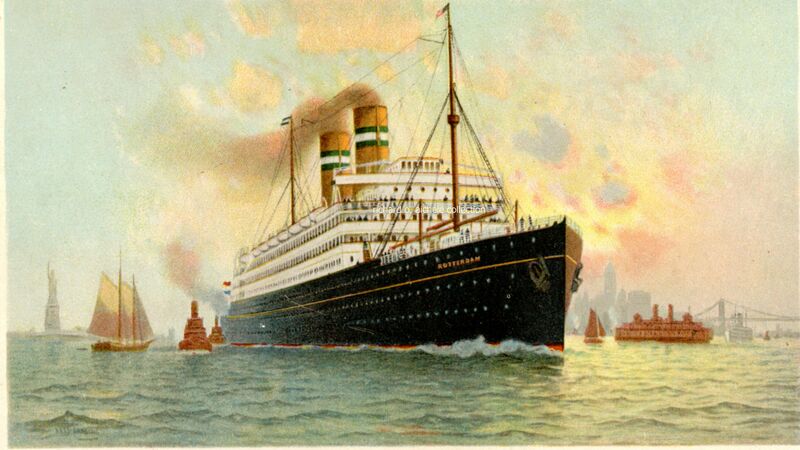 Following the war and after extensive refitting and restoration, the Nieuw Amsterdam embarked on a long and successful career as a passenger liner in both regular trans-Atlantic crossings and seasonal cruise service. Considerable advances will also be noted in the interior decorations. "Modern architectural ideas supplemented by individual works of art of the younger generation of artists have created interiors of distinct originality and beauty. Although individually the artists' visions and execution may vary, we believe that a symphonic whole has been achieved and this ship belongs to the future," A statement from the ship's introductory publication. A statement from S.S. Nieuw Amsterdam introductory publication. 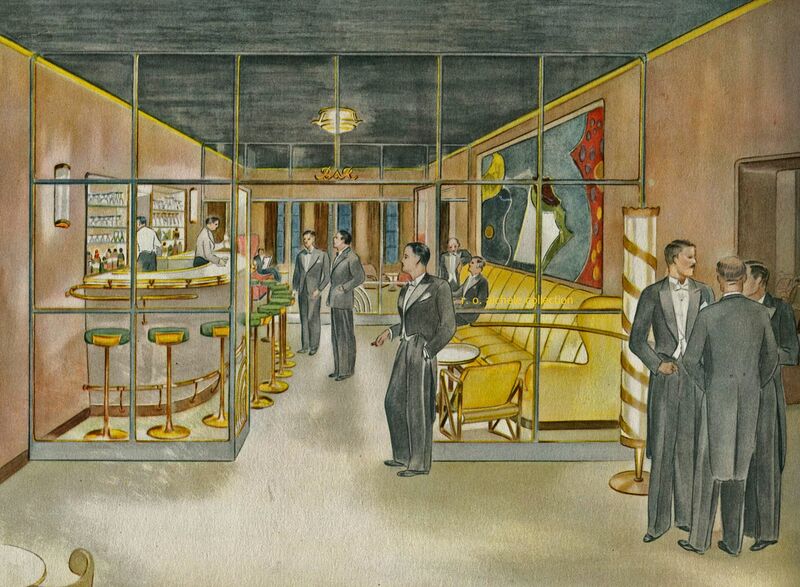 Art-Deco styles such as the Cabin Class bar were wonderfully done. located in the well of the main deck vestibule included Autumn. a cruising speed of 21.50 knots. suddenly interrupted by moments of shear terror. 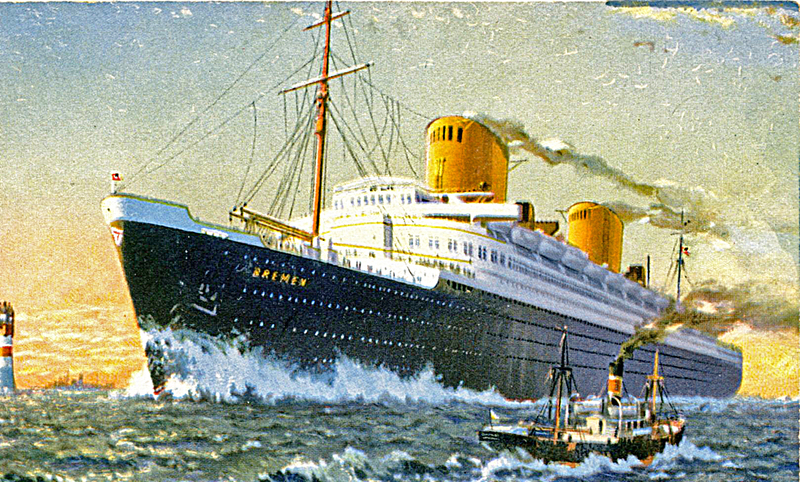 The S.S. Stockholm of the Swedish American Line sailed from New York at 11:50 AM on July 26, 1956 on an eastbound course enroute to Gothenburg, Sweden. 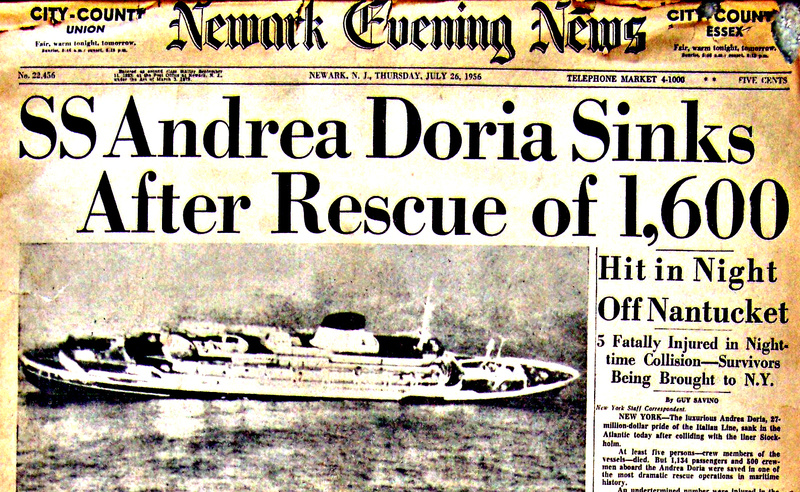 At the same time, the S.S. Andrea Doria of the Italian Line was westbound from Genoa, Italy to New York with arrival scheduled for the early morning of July 27, 1956. Under ideal maritime conditions, the schedules and courses of the two ships would have had them passing each other at a combined speed of 40.3 knots about 11:00 PM on July 26 in the vicinity of the Nantucket Lightship. The Nantucket area is known for the blanketing advection fogs that existed that night. The Andrea Doria had sailed west at a 21.5 knot speed with very limited visibility through the fog bank. The Nantucket Lightship was totally enveloped by the fog. The Stockholm was also sailing at near full speed under clear skies because she had not yet encountered the fog ahead. Although the radars on both ships showed the other ship, the heavy fog was the reason the crews on the two ships did not visually see each other and observe how close they were to each other until almost the last moments. Certain in his mind of the position and course of the other ship, Carstens decided he would increase the safety margin for the passing. "Starboard," he called out and the helmsman turned the wheel two complete turns to the right. Carstens watched the Stockholm's bow swing away from the approaching ship...satisfied the ships would pass safely port-to-port. [Then] The lookout stared in disbelief...the other ship was going to cross the bow of the Stockholm. [Minutes later] Carstens saw the enormous broadside of a giant black ship sparkling with lights...the ship was heading across his bow. He saw the glow of the ship's green running light. It was the starboard side of the other vessell. On the Andrea Doria�s bridge. �She is turning, she is turning!� the young officer screamed. �She is showing the red light!� He gasped for air. �She is coming toward us!� It was impossible to believe this was happening. The masthead lights were opening. The other ship was turning to her right and heading for the Doria. This was the moment of decision�.Captain Calamai called out �All left.� Calamai had decided that it was too late to try to stop the Andrea Doria. His only hope was the Doria�s speed. He decided that he must outrace the other ship, turning left faster than he could swing her to the right�Then it was too late. Calamai saw the dim outline and then the bow of the other ship as it came out of the night at the Doria. The bridge scenes descriptions above are quoted from the book Collision Course by Alvin Moscow. The two ships collided at 11:11 PM. 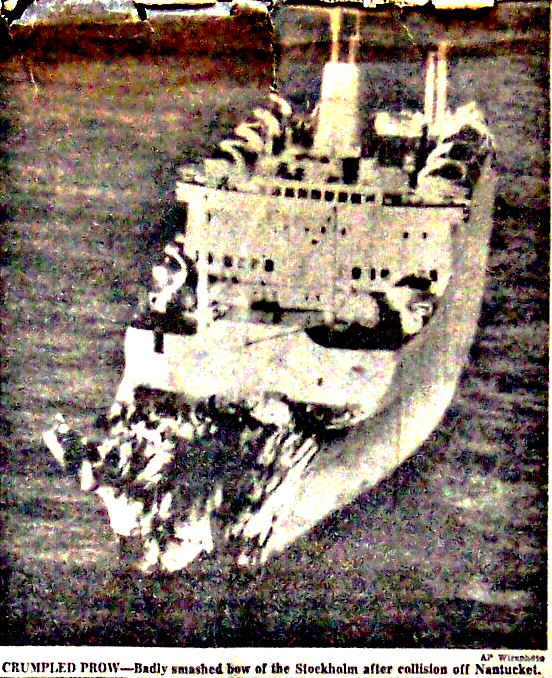 Immediately after the collision the two ships separated due to the forward momentum of the Andrea Doria. The large hull opening allowed a rush of sea water into the hull of the Andrea Doria leading to a rapid 20 degree list to starboard. That list slowly increased to more than 30 degrees during the night. The rapid list also resulted in making all the lifeboats on the port side useless. Without the rapid assistance of other ships especially the French Line's Ile de France there would have been many casualties. 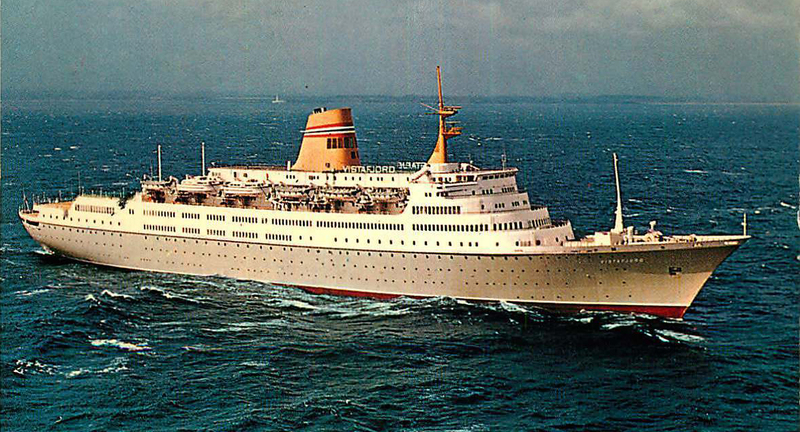 The Stockholm was launched in 1948 and its passenger capacity was increased in 1953 from 395 to 548 with outside cabins for all passengers. The ship�s design provided for a strengthen bow to deal with ice conditions in northern Swedish and Baltic waters. The Objective Forensic Analysis of the Collision Between Stockholm and Andrea Doria by Samuel Halpern. In April 1912, "She was the bigest boat that had ever been in the world. She implied the utmost stretch of construction, the furthest achievment in efficiency, the bewildering embodiment of an immense multitude of luxuries for which only the richest of the earth could pay. The cost of the Titanic was tremendous - it had taken many millions of dollars - many months to complete her. 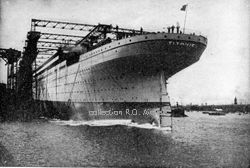 Besides (and best of all) she was practically unsinkable her owners said; pierce her hull anywhere and behind was a watertight bulkhead, a sure defense to flout the floods and hold the angry ocean from its prey," wrote Thomas H. Russell in his book, Sinking of the Titanic published in late 1912. The White Star Lines R.M.S. Titanic according to testimony at one of the accident investigation hearings determined the ship was designed for a full speed of 22 to 23 knots based on propulsion revolutions of 78 at full sped. At the time of striking the iceberg revolutions were "not more than 72" or in ship speed was at the rate of about 21 knots." 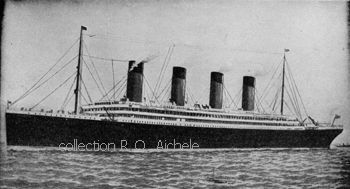 Russell explained, " If the Titanic was not as fast a ship as the Lusitania or Maurtetania she was expected to make a good record on her maiden voyage which could not be done unless she held to a prescribed route. It was certainly in the power of Mr. Ismay to have the Titanic's course changed to the southwhen dangerous ice was reported ahead. The warning had come by wireless from the Amerika the day before the disaster." 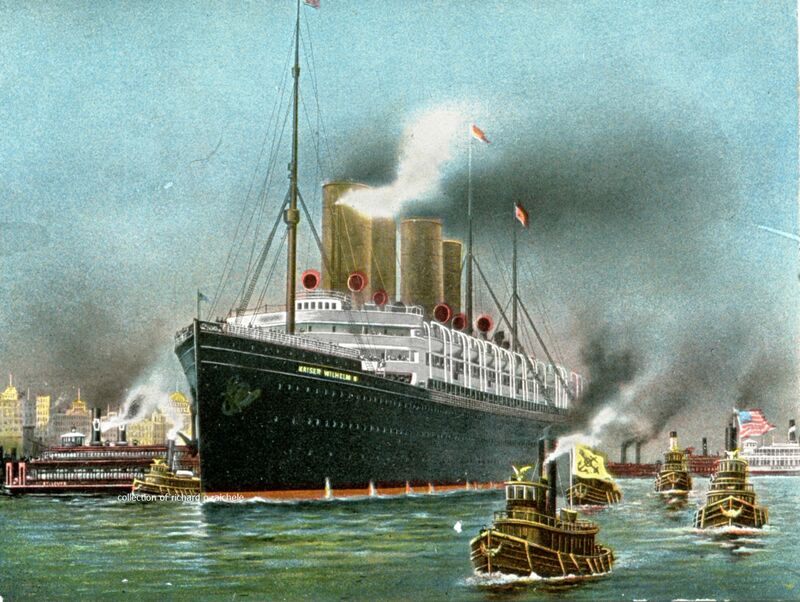 However, on the ship's maiden voyage from Southamton, England to New York City during the night of April 11 - 12 the ship was "steaming almost full tilt through a gently swelling sea and under a starlit sky. The great liner was plunging through a comparitively placid sea on the surface of which there was much mushy ice and here and there a number of comparitively harnless looking floes. The first intimation of the presence of the iceberg that Chief Officer Murdock received was from the lookout in the crow's nest. They were so close upon he berg at this moment that it was practically impossible to avoid a collision with it." Russell wrote, "The first officer did what other unstartled and alert commanders would have done under similar circumstances -- that is, he made the effort by going full speed ahead on his starboard propeller and reversing his port propeller, simultaneously throwing his helm over to make a rapid turn and clear the iceberg. The maneuvers were not successful. He succeeded in preventing his bow from crashing into the ice cliff but nearly he entire length of the great ship on the starboard side was ripped. The speed of the Titanic, estimated to be at least twenty-one knots, was so terrific that the knifelike edge of the iceberg's spur protruding under the sea cut through her like a can opener. The shock was almost imperceptable. The first officer did not apparently realize that the ship had received its death wound." Deep within the bowels of the Titanic, the stability of the ship was being compomised another on-going event unknown to the passengers. A fire was ongoing in two of the coal bunkers holding hundreds of tons of coal for the ship's boilers. The fire started in one of the coal bunkers either just before sailing or just after the ship left the Southampton pier enroute to New York City. Coal loaded earlier was at the bottom of the bunker and had become dry. It was then covered with wet coal "as all the coal should have been" according to one fireman. Heat generated in the dry coal by spontaneous combustion caused an intially smoldering fire. However, the fireman recalled, "The wet coal on top kept the flames from coming through but down in the bottom of the bunker, sir, the flames was a-raging." According to Russell as told by another fireman to combat the fire during the voyage, "it had been necessary to take the coal out of sections 2 and 3 on the starboard side, forward, and when the water came rushing in after the collision with the ice the bulkheads would not hold because they did not have the supporting weight of the coal. Somebody reported to Chief Engineer Bell that the forward bulkhead had given way and the engineer replied: 'My God, we are lost.' The engineers stayed by the pumps and went down with the ship. The foremen and stokers were sent on deck five minutes before the Titanic sank, when it was seen that they would be inevitably lost if they stayed longer at their work of trying to keep the fires in the boilers and the pumps at work. The lights burned to the last because the dynamos were run by oil engines." One survivor's account from a lifeboat: "In the distance it looked an enormous length, it's great bulk outlined in black against the starry sky, every porthole and every saloon blazing with light. It was impossiblt to think anything could be wrong withy such a leviathan were it not for the ominous tilt downward at the bow, where the water was by now up to the lowest row of portholes.Presently about 2 A.M. as near as I can remember, we observed it settling very rapidly, with the bow and bridge completely under water, and concluding it was now only a question of minutes before it went; and so it proved. it slowly tilted straight on end, with the stern vertically upward, and as it did, the lights in the canins and saloons, which had not flickered for a moment since we left, died out, cameon again for a singke flash and finally went out altogether. To our amazement the Titanic remained in that upright position, bow down, for a time which I estimate as five minutes, while we watched at least 150 feet of the Titanic towering above the level of the sea and looming black against the sky. Then the ship dived beneath the waters." 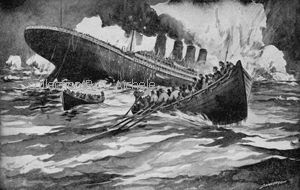 Following the Titanic disaster with 1,517 lives lost, the public from immigrants to the wealthy were cautious about the trans-Atlantic liners image. 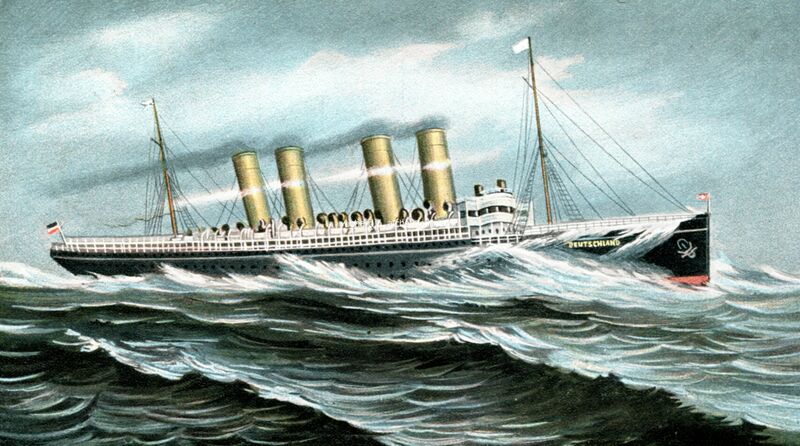 Tom Hughes in his book, The Blue Riband of the Atlantic noted, "The sinking of the Titanic on her maiden voyage in April 1912 inevitably led to a reaction among nervous section of the regular transatlantic travelling public against 'large and fast liners' and for a time passenger carryings in the Lusitania and Mautetania were lower than usual....the public had temporarily lost faith in speed at sea -- particularly on the North Atlantic run." The failure to provide enough lifeboats for the passengers and crew on board has long debated. During the following one hundred years, lack of working lifeboats in a severe event has still not been totally resolved. A reality is that even if the number of lifeboat seats equals the number of souls on board, events such as a stricken ship listing heavily to one side can make the lifeboats and other vessel flotation devices on one or both sides ineffective or inoperable. The condition of the lifeboats and the lowering of the lifeboats was later commented on by one of the surviving passengers, Mrs. George N. Stone of Cincinnati, said, "Had there been any sea running instead of the glassy calm that prevailed, not a single passenger would have safely reached the surface of the water. The men did not know how to lower the boats, the boats were not provisioned and many of sailors could not handle an oar with reasonable skill." Russell also reported, "Albert Major, steward of the Titanic, admitted there had been no lifeboat drills and that the lifeboats were poorly handled. 'One thing that comes in my mind above all else as I live over again the sinking of the Titanic we of the crew realized at the start of the trouble that we were unorganized. Although every man did his duty, we were hindered in getting the best results because we could not pull together. The only time we were brought together was when we were mustered for roll call about 9 o'clock on the morning we sailed. From Wednesday noon until Sunday nearly five days passed, but there was no boat drill." Photos show Titanic life boats next to or approaching the rescue ship S.S. Carpathia. The first half of the Twentieth Century saw U.S. ports of all sizes served by a thriving maritime trade conducted primarily with U.S. built and U.S. flagged coastal vessels from fast passenger inter-city ships to small, plodding freighters. S. S. Dixie "One of the Staunchest Vessels"
The entry of the S.S. Dixie in the late 1920s offered travellers a new ship for a popular railroad / passenger ship combination used by some for their trans-continental journeys. Flying the flag of the Morgan Line, owned by the Southern Pacific Company, the passenger and cargo vessel Dixie made the trip between New Orleans and New York in five days northbound and six days southbound while passengers enjoyed "a veritable sightseeing trip at sea with much of the Atlantic coast visible from the ships." The Dixie joined two other Morgan Line ships, the Momus and the Creole, already serving the route that connected with the Southern Pacific Railroad's popular passenger trains from the west coast at the railroad's eastern terminus in New Orleans. 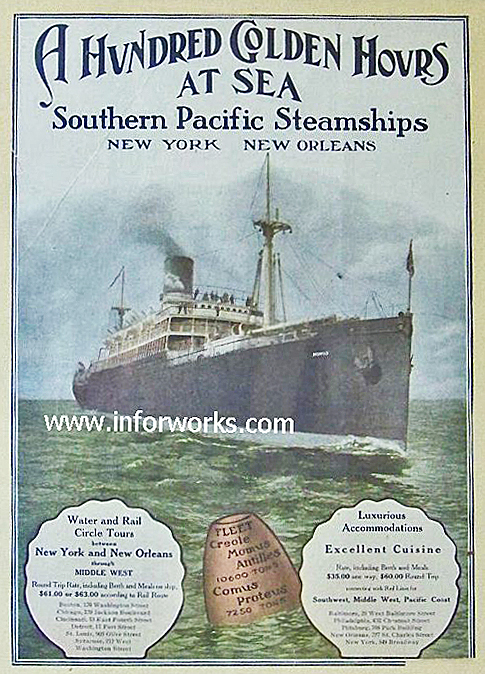 Fares between New York and New Orleans were $63.00 for first class, $48.00 for second class and $33.00 for third class. Aboard the Dixie, first, second and third class passengers could enjoy handsomely decorated and luxurious" cabins in an American colonial design. Other amenities included hot and cold running water plus hot and cold fresh and salt water in all baths, cabins heated by electro-vapor radiators, a telephone system, barber shop, sun parlor, dance room, dining saloon and a lounge. The ship was equipped with the latest navigation devices. "The radio direction finder, installed in the pilot house, enables accurate radio-bearings to be taken on special beacon stations established by the U.S. Government Bureau of Lighthouses or on any radio shore station of ship. Bearings may be taken with this instrument at a distance of several hundred miles." Equipment also included a Sperry Gyro Compass and Sperry Gyro Pilot. "The Sperry Gyro Pilot, known to seamen as 'Metal Mike,' provides a perfect and reliable mechanical method of steering, a simple contact mechanism guided by the Gyro Compass being utilized to control the movements of the ship's steering wheel." The ship's keel was laid January 31, 1927 at the Federal Shipbuilding & Dry Dock Company in Kearny, N.J.and the vessel was launched July 29, 1927. The 12,440 ton, 445 ft. long passenger and cargo vessel was "acclaimed as one of the staunchest vessels ever turned out of a shipyard." Built as an oil-burning vessel, the steam turbine propulsion connected to the single propeller could drive the ship at a speed of 16.5 knots. The S.S. Dixie was sold to the U.S. Navy in 1940 and converted to a tender to provide a mobile base and repair facility supplying fuel, ammunition and stores to destroyers and destroyer escorts. 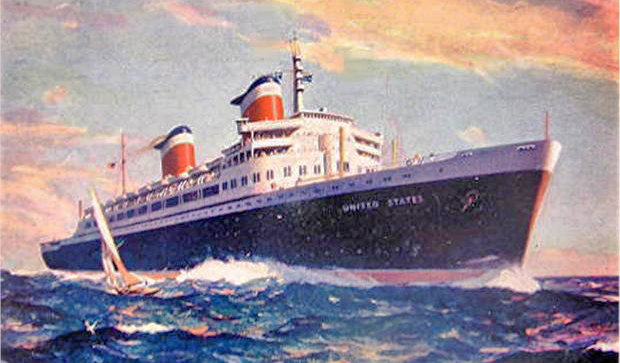 She was scrapped in Baltimore in 1950. The voyage was advertised as A Hundred Golden Hours At Sea. The ship, on its regular voyages between New York City and New Orleans, sailed along the Atlantic Ocean coastline, around the tip of Florida and then through the Gulf of Mexico waters New Orleans. Interestingly, the S.S. Momus and four other ships, the S.S. Creole, S.S. Antillles, S.S. Comus and S.S. Proteus were owned and operated by one of America's most famous railroads - The Southern Pacific Company. The Southern Pacific Railroad's trans-continental regular passenger trains travelled as far east as New Orleans, Louisiana. To provide through connecting service between New York City and the railroad's routes through the Southwest and the Pacific coast, the railroad created the Southern Pacific Steamship Company to offer passenger and freight trans-continental service. On the maritime portion, the journey was promoted as A Hundred Golden Hours At Sea on the routes shown below. Some Southern Pacific Steamship Company ships served Galveston, Texas but the Momus normally sailed between New York City and New Orleans. The S.S. Momus was a relatively fast ship for that era capable of at a sailing speed of 17 knots. The S.S. Momus was among the finest ships sailing in the coastwise trade. She had abundant facilities for handling cargo...She was lighted by electricity and used artificial means of ventilation...Passenger quarters were built on the main deck, according to Shipbuilding at Cramp & Sons written by Farr, Bostwisk and Willis about the Philadelphia, Pennsylvania shipyard that built the Momus in 1906. The ship sailed in regular commercial service until taken over by the U.S. Navy during World War I as a troop transport. In 1936, she was taken to Japan and scrapped. Passenger vessel travel between Boston and New York took a major step forward with the beginning of regular service by the steamers S.S. Yale and S.S. Harvard on September 18, 1907. The Yale was the first of the two ships completed and she made her first trip from New York to Boston in June in just under 14 hours. The two ships were outstanding products of American shipbuilding skills of the period. The 3,818 ton ships built by the W.A. Fletcher Company in Chester, PA were 407 feet long with a 63 foot beam. Powered by twelve Scotch type boilers generating 12,000 horsepower and turbine engines, the triple-screw vessels could maintain an average speed of 20 knots. The Yale was the third turbine ship ever built in America and was the fastest ship in America's merchant marine when completed. Interior appointments were plush. 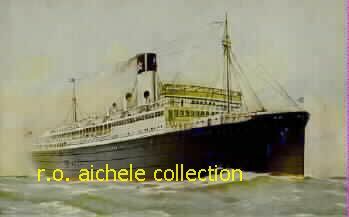 The overnight passengers were accommodated in staterooms on the two lower passenger decks. Outside cabins opened onto promenade decks along each side of the ship while inside cabins were accessed from passageways. There were also 22 luxury cabins on a forward upper deck. According to one published account at the time, "In the matter of interior decoration and fittings the ships strike a new note, and it is safe to say that in no American steamer yet built has there been so elaborate and beautiful a scheme of embellishment incorporated in the design." 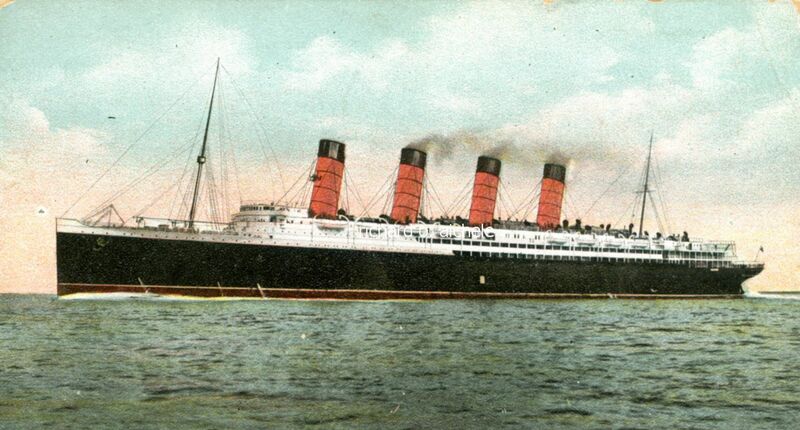 Their modern appearance with high bow and twin smokestacks racked back, the fine interiors and the judicious selection of their names all combined to make the two high speed ships extremely popular and profitable on the Boston - New York route. In good weather or fog, the steamers consistently maintained the fast schedule. They normally ran full during the long summer season and never lacked for passengers the remainder of the year. Click to visit the ARCHIVES for links to other ship design technical articles.